I’ve done a few stew posts in the past – Mediterranea beef and lamb stew, beef and pork stew with barley, chicken and herb stew and a more traditional beef stew. With temperatures dropping into the 40s here in the evenings, it feels like it’s time to dig back into some hearty stews. As always, one of the biggest rewards of making stew in the slow cooker is the joy of coming home to a house filled with the smell of dinner ready to eat. I rarely make the exact same thing twice because part of the fun of cooking is playing with seasonings and ingredients. So, this is based primarily on the basic beef stew linked above, but with some new tweaks to make it a little more interesting. 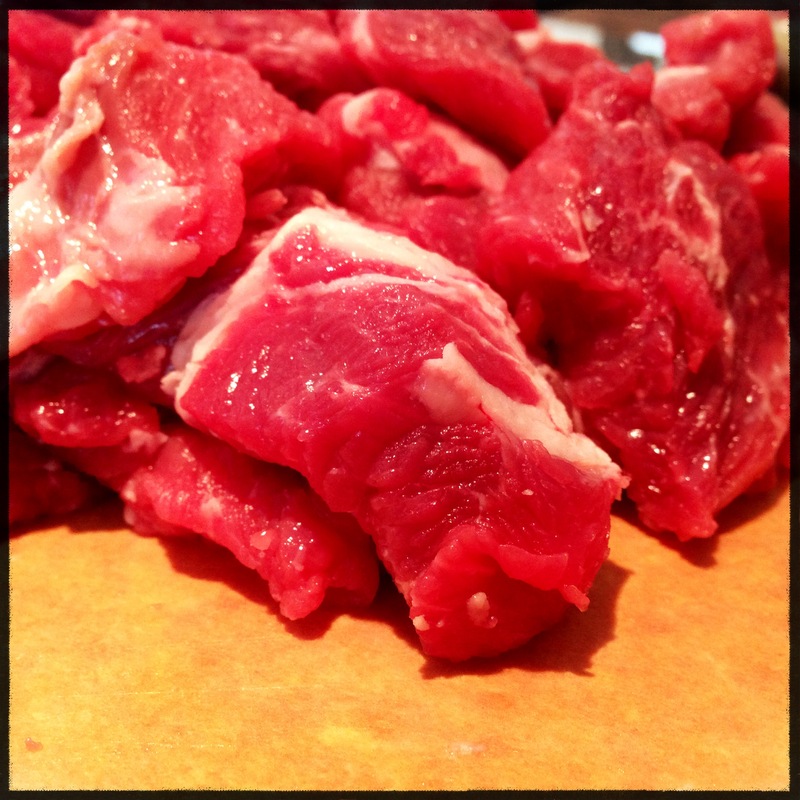 There’s no right answer when it comes to deciding what cut of meat to use for stew. 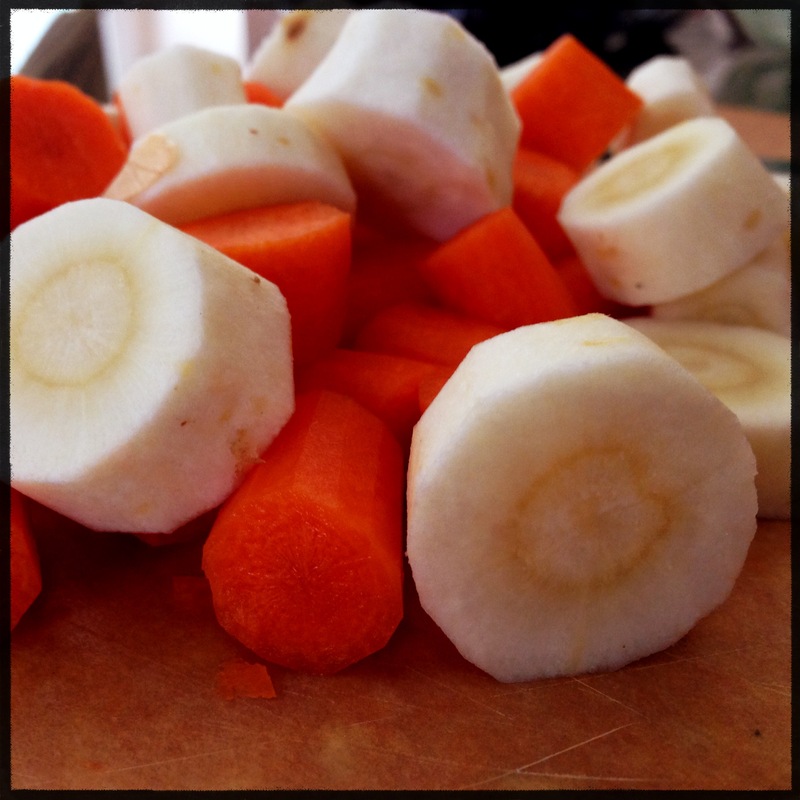 I prefer not to use an overly lean cut simply because fat makes the stew taste good. It melts out of the meat during the cooking process, which means the meat itself will be very tender, but the broth will be well flavored by the fat. I typically go for chuck as it is inexpensive, well-marbled and always available. 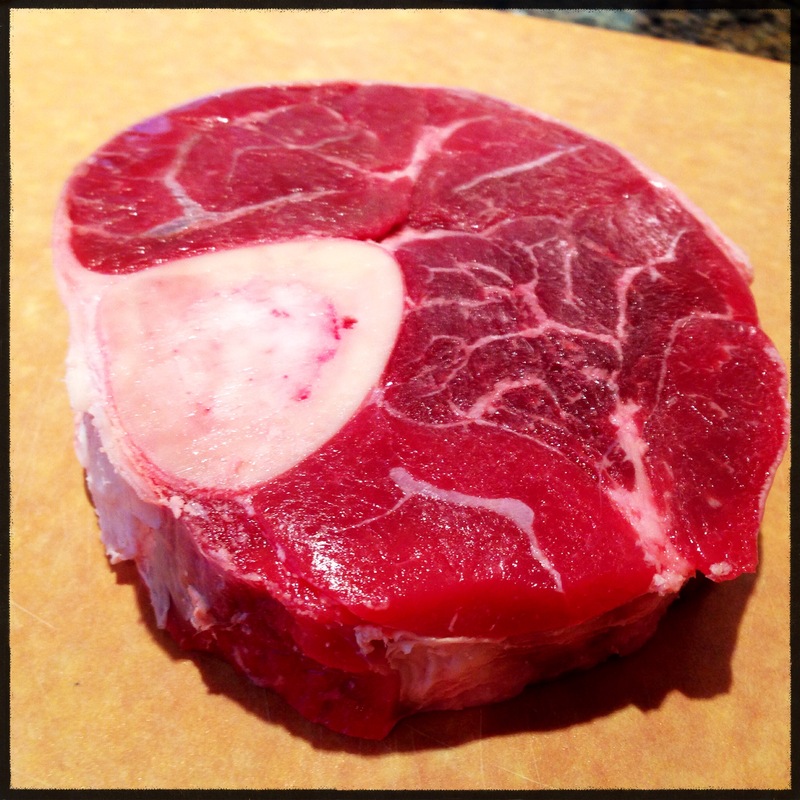 Recently, my butcher started selling thick slices of beef shank including the bone. I couldn’t resist adding all that delicious marrow flavor to the stew, so I grabbed one shank “steak” and to use in addition to the medium-sized cut of chuck above. 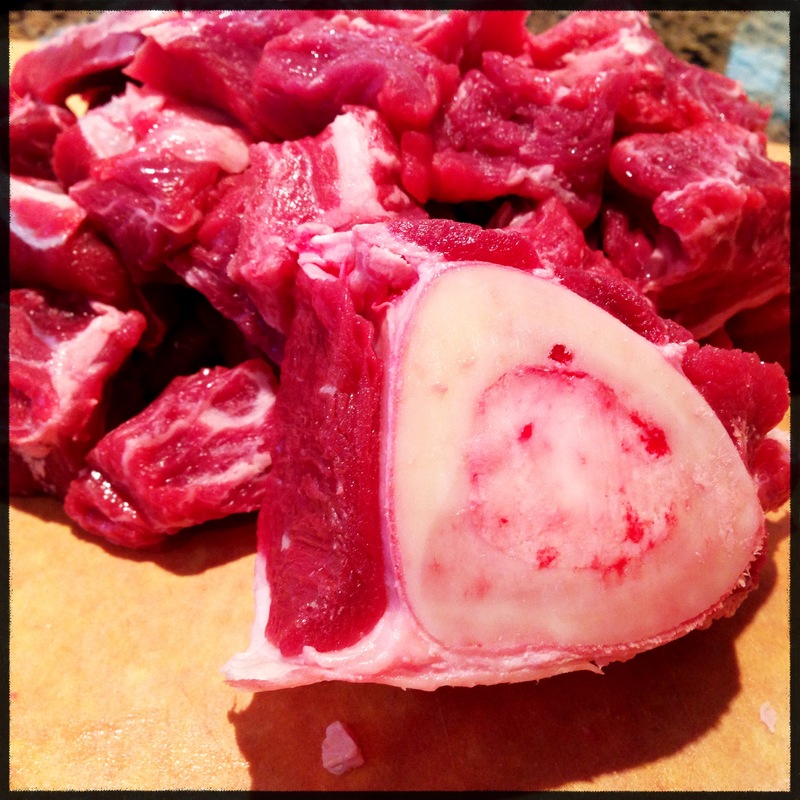 Breaking these pieces down is not much work, so I never pay extra for pre-trimmed “stew meat.” I do trim away the biggest pieces of fat and any membranes or other connective tissue around the meat, but I try to keep the marbling as much as possible in my stew chunks. The shank was cut up the same way. I trimmed the meat away from the bone. There was still a little bit of meat on the bone, but it fell away in the cooking process. More importantly, all the delicious flavor in the marrow made its way into the stock during cooking. 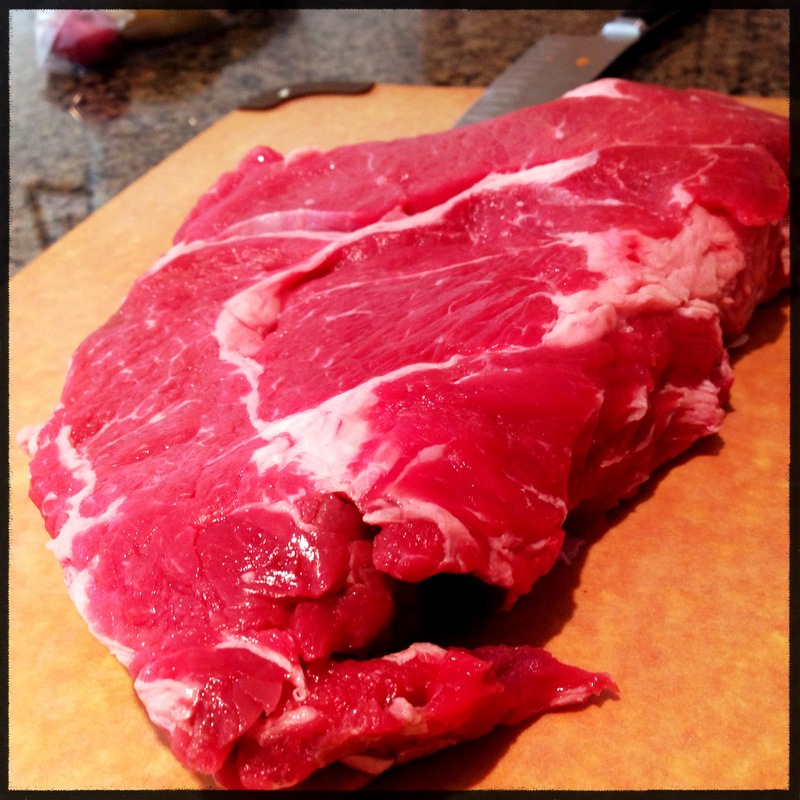 Whenever you have the option to buy meat with a bone for slow cooking, always go for it. There is no other seasoning or spice that will improve the flavor like bone and marrow. 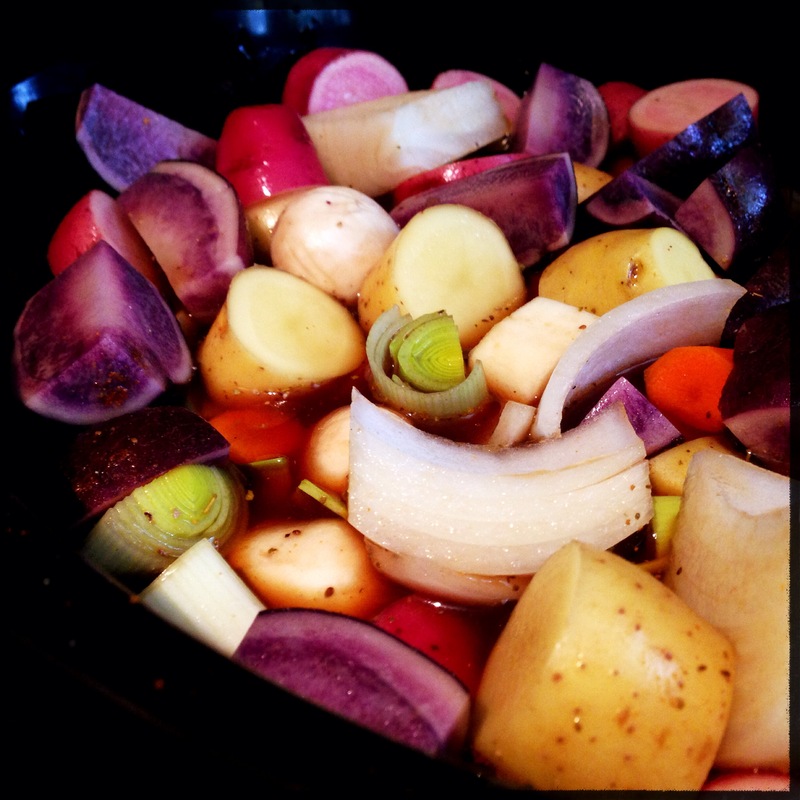 Once the meat is prepped, add it to the slow cooker and start in on the vegetables. I prefer a hearty, rustic feel to my stews, so I always chop roughly rather than neatly with uniform pieces. 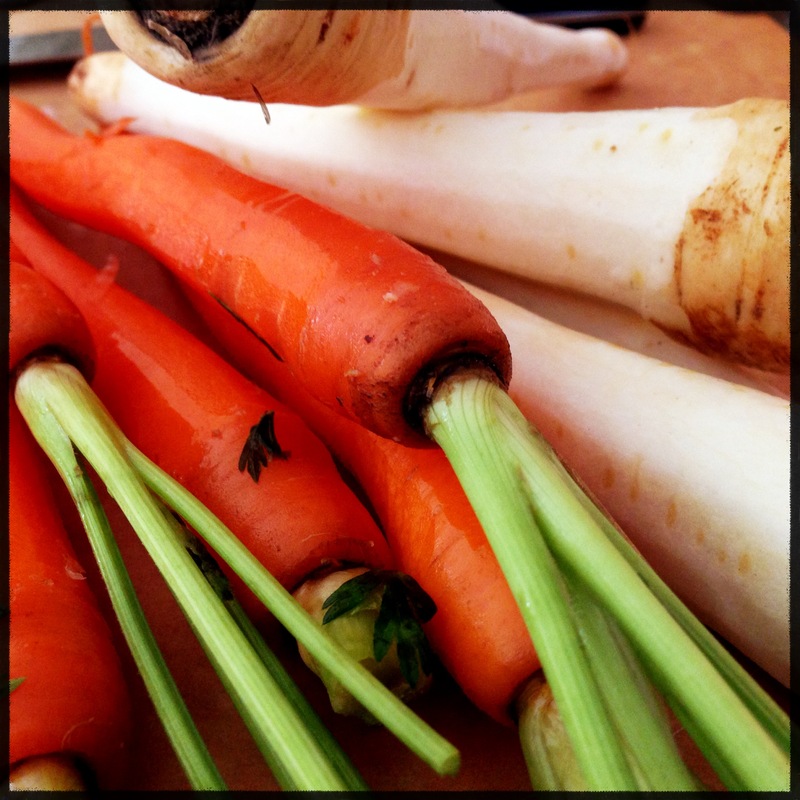 Peel the carrots and parsnips, and chop them into pieces. 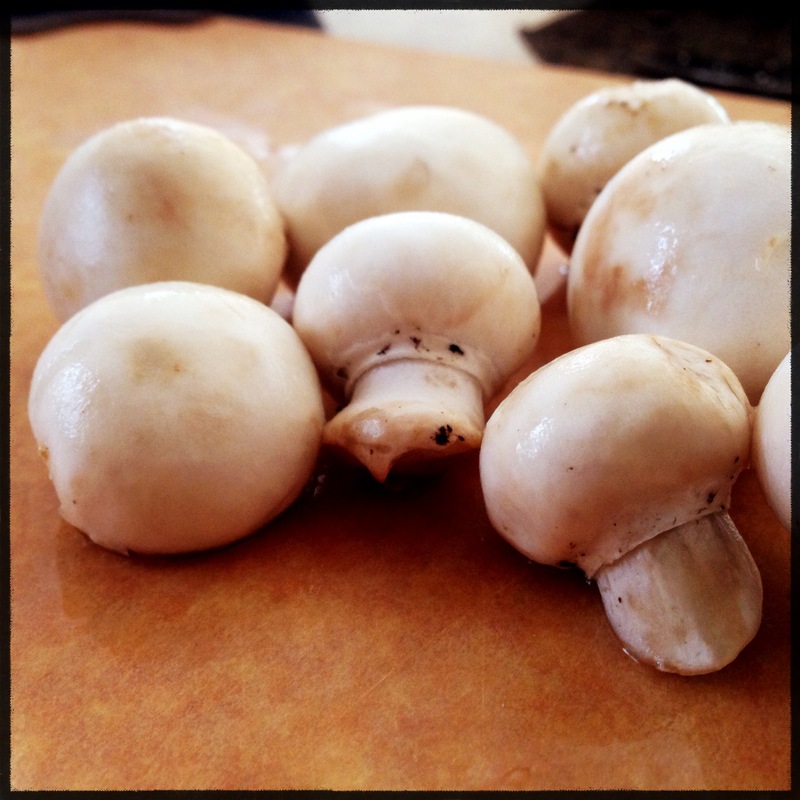 I have been using baby white mushrooms a lot lately because I really like using them whole. I think they’re visually appealing when left whole, and they are more fun to eat as well. 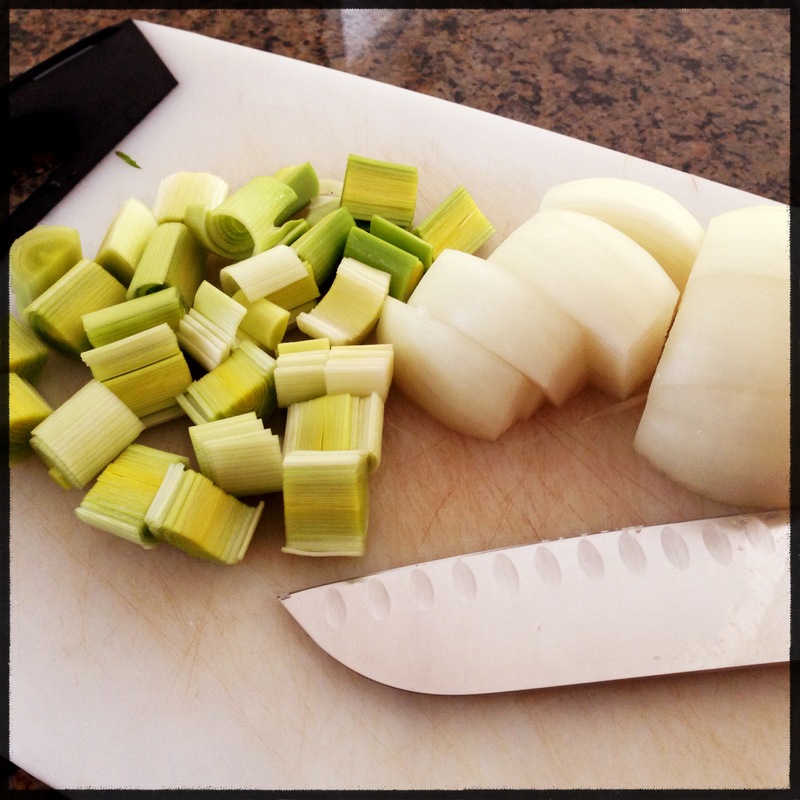 Chop and rinse the leeks. I cut these a little smaller since they’re almost used more as an herb than a vegetable in my stews. The onions, however, I chop into large wedges and throw in as big chunks. Finally, the potatoes. While it’s technically a culinary no-no to cook potatoes for excessive amounts of time, I like the way they taste when cooked in the stew juices for several hours, so I always toss them in for the full time. It’s completely reasonable to put them in later in the cooking process if you prefer, but that also can be a hassle since part of the beauty of the slow cooker is the “set it and forget it” nature of using it. I leave the skin on the potatoes and cut them into rough quarters. For the fingerlings, I just cut them into disks about an inch thick. As always, there’s no right or wrong way to do it. Chop them as you like or even leave them whole if they’re small. They’ll taste great no matter what you do. 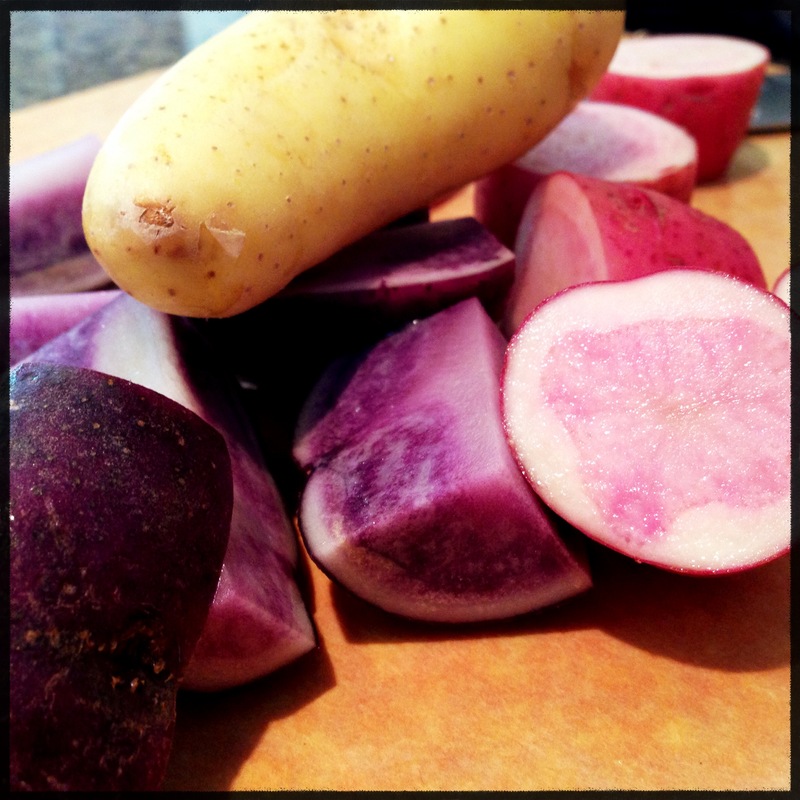 I used a mix of gold fingerlings, baby purple and pink gemstone potatoes. These varieties are always readily available in my local produce department, but any small potatoes will work if some of these are harder to find in your area. Once all the vegetables and potatoes are in the cooker, add the garlic and seasoning. 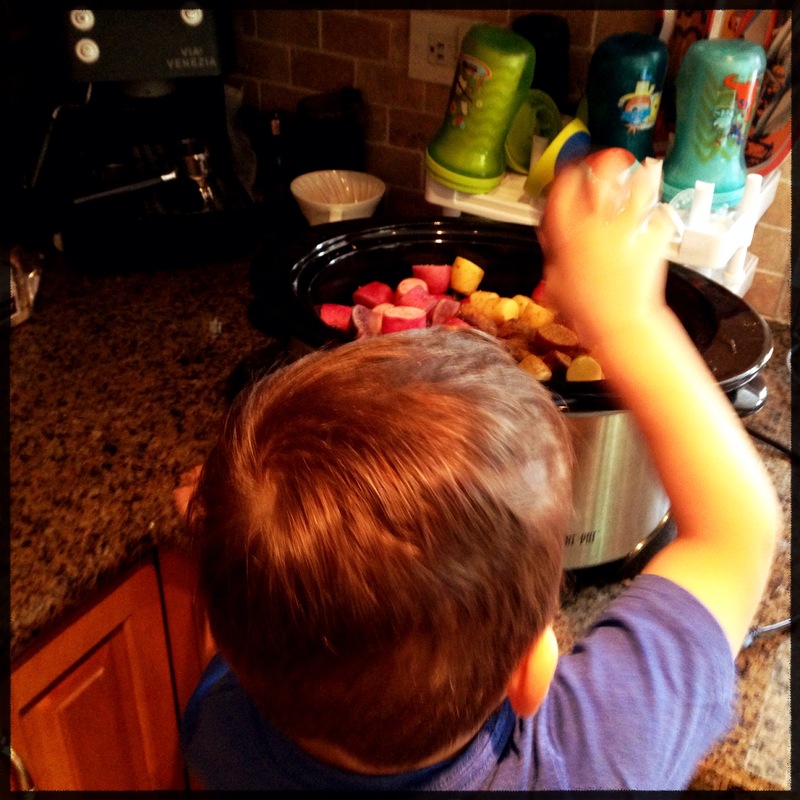 Since there is no open flame or heat source while you’re loading up the pot, slow cooker meals are a great opportunity to enlist the help of any budding chefs you may have hanging around. Add the stock to the pot last, and gently stir everything around a few times. Don’t worry if the stock doesn’t cover everything entirely as this is not necessary to have everything cooked. There will be plenty of steam and moisture to cook any exposed items above the stock. Set the cooker on low for at least six hours (I usually go with eight hours), and you’re all set. When it’s time to eat, you can dose out large portions of the broth to serve this stew more like a hearty soup or just use a little of the liquid more like a gravy over the stew. Since it makes a large quantity, I typically eat it dryer on the first night and then more like a soup the second night. The added broth helps it reheat more evenly in the microwave when warming it up as a soup, and the added broth makes it feel more like a different meal than just “boring” leftovers. However you make it and however you serve it – Enjoy!